Choose the Brother FAX-2940 High Speed Mono Fax Machine (FAX2940ZU1) for a capable fax machine that doubles up as a printer and scanner for your PC. 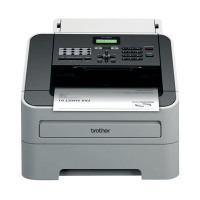 It supports the high speed Super G3 connection for fast transmission of faxes, so you're never kept waiting around for a fax to send. The 22 speed-dial fax number memory lets you store commonly-used numbers, saving you even more time. Plug it into your PC and you can even use it as a versatile printer and scanner.